Writer’s block. It happens to all of us, even in the PR world. While it may seem like the assignment sitting in front of you is doomed to never be completed, there are ways to get out of this funk! We searched the web and found several life-saving tips on how to beat writer’s block. Even though your thoughts might be scrambled and every idea that comes to mind may sound boring, just write it down! Although you may never be able to use most of the content that you are scribbling, keep going! According to Forbes, writing nonsense may seem counterproductive. However, the idea is that by the end you will at least have some jumping off points that you can use to build on to your writing. 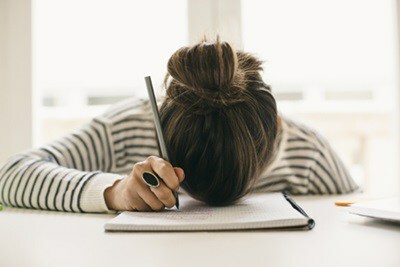 While for some people exercising may seem like an even worse time than staring at a blank page, it is actually one of the number one ways to get your creative juices flowing. According to Business Insider’s article on how to conquer your writer’s block, “studies have shown that immersing yourself in nature, such as by taking a hike or going for a walk in the park, can increase creative thinking [and] other psychological benefits include increased short-term memory, sharper thinking, stress relief and restored mental energy.” So if you ever find yourself facing the dreaded writer’s block; go to a park, walk your dog or even just take a lap around the office. Your mind and your body will thank you later. Writer’s block happens to everyone, even professional writers. No one has ever been able to write a flawless article / book / essay in just one sitting. Just think, J.K. Rowling didn’t write the Harry Potter series in a day, so relax! Good writing takes a lot of trial and error and while it may be frustrating, it only helps you improve. Stop letting the pressure of perfection weigh you down, because once you take the pressure off yourself, your creation process will become easier.